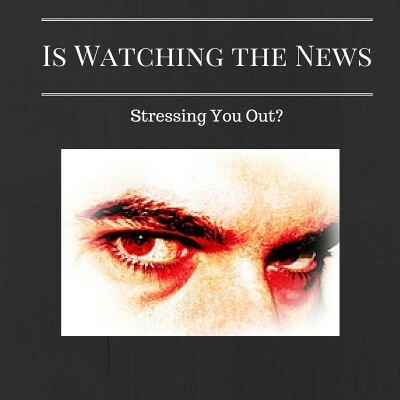 Is Watching the News Stressing You Out? Watching the news is having a negative affect on our mental health. I have noticed relationships between family and friends straining and breaking as we argue and disagree about the causes and solutions to our problems. What I know about problems and solutions is this: Creative and solutions focused thinking, deep listening and flexibility are the ingredients needed to solve the complicated problems we face in our families and communities. Stress, worry, ego and anxiety will always prevent collaboration and understanding. If you are stressed out, understanding the root cause is critical, and will dictate the best course of treatment. The root causes of anxiety vary a great deal from one person to the next. Some of us are predisposed to anxiety because of heredity factors. We inherit personality types from our parents which make us susceptible to becoming easily excited, aroused or threatened. Anxiety might also be sustained through our beliefs, behaviors, or emotions. When we sustain anxiety we are often engaged in anxious self-talk, irrational beliefs, or disassociating from feelings. Irrational beliefs often have their genesis in childhood. We inherit them from our family of origin. For example, if the unspoken family rule was “We don’t talk about feelings”, we may assume this behavior. Irrational beliefs further support the behavior. We may subconsciously think “I am weak when I talk about feelings”. As the cycle continues as we begin to disassociate. We try not to feel anything when in reality, anger, worry and fear is marinating somewhere deep inside, waiting for the right conditions to erupt. The final nail in the coffin occurs when we begin to only pay attention to the stimulus that supports our entrenched beliefs and perceptions. We see what we want to see. We only tune in to the news or radio shows which will support our pre-existing beliefs. Short-term causes of anxiety are driven by experiences we have in the world. A personal experience with a traumatic event is the hallmark experience which leads to Post Traumatic Stress Disorder (PTSD). Witnessing a traumatic event in which we feel threatened or in danger can create PTSD symptoms. PTSD is particularly relevant concern today. When we turn on the news we risk witnessing a traumatic event in which we feel personally threatened. Here are a few solutions to reduce anxiety, stress and worry. A healthy mind must be supported by a healthy life style. If your lifestyle lacks exercise, a healthy diet or adequate rest, try to address these issues first. Begin with small changes. If a gym membership makes you feel overwhelmed, begin with a 15 minute walk. Minimize the personality traits that feed anxiety. If you are a glass half-empty personality, try to see the glass half-full. Don’t expect changes to come all at once. This will be a gradual process. Start with a paradigm changes few times during the day. I like the book Hardwiring Happiness by Rick Hanson which provides great exercises for changing how we internalize environmental stimulus from a half-empty to a half-full paradigm. Breathe and be in the present moment. Learn to turn down the racing thoughts. Stop right now and practice. Find something in the present moment that is beautiful, graceful, calming. Often we over-look stimulus in the present moment that will bring us peace, joy, or calm. There are many options for learning mindfulness. Meetup typically offers local groups that provide instruction and support for learning and practicing. I learned a great deal about mindfulness from reading books. You A. re Here by Zen Master Tich Nhat Hanh is beautifully written, simple and easy to apply. If you are new to meditation, begin with guided meditations which can be found on-line for free. Use a comprehensive treatment approach. .We are holistic beings. A change in our physical behavior can change our attitude and vice versa. Do not limit your treatment to one area. If you take up exercise, that will likely reduce anxiety or other psychological symptoms. Try to expand your consciousness and be willing to try changing your behaviors, thinking patterns and how you emote. You can then learn to alleviate the symptoms of anxiety. I often tell clients to try and be the best version of you. This best version is not a version that is hyper-vigilant, afraid, or worried. The best version is flexible, expressive, authentic, happy and calm. Be this. The world needs you at your best.